Plants, invertebrates and fish vertebrates were studied in an excavation campaign of the 30-cm-thick Upper Permian Kupferschiefer Member (Werra Formation: Lower Zechstein, Lopingian) in the Hüggel (Osnabrücker Bergland, NW Germany). Taphonomy was mapped at six different planal levels on a 12 m2 area. Plant remains belong mainly to terrestrial conifers Ullmannia frumentaria (Schlotheim) and Pseudovoltzia liebeana (Geinitz), and rare Quadrocladus solmsii (Gothan and Nagelhard). Marine invertebrates consist mainly of the common nautilid Peripetoceras freieslebeni (Geinitz). Of importance is a rich fish fauna with rare skeletons of elasmobranchs Wodnika striatula Münster and Janassa bituminosa (Schlotheim) and numerous actinopterygians, dominated (83%) by Palaeoniscum freieslebeni Blainville as juvenile to adult individuals in different stages of disarticulation. Other, rarer, ray-finned species, including Pygopterus humboldti Agassiz, Platysomus striatus Agassiz, Eurysomus macrurus (Agassiz), Dorypterus hoffmanni Germar and Acentrophorus glaphyurus (Agassiz) are typical for the diverse European Late Permian Zechstein Sea fauna. Most important are concentrations of Coelacanthus granulatus Agassiz (3% of total), also represented by juvenile to adults. Fossil density variation within the Kupferschiefer reflects paleoenvironment in a shallowing-up sequence and bathymetrical change from deeper water to zones close to coastal patch reefs. The shallow-water submarine swell zone at Hasbergen can be related to uplift of the regional Hüggel Horst. 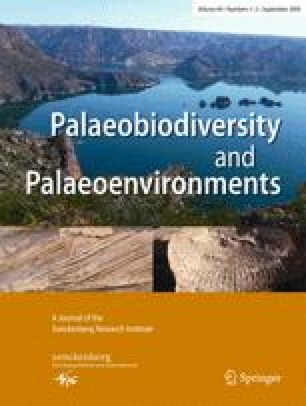 Charcoalified wood indicates forest fires, and palaeocurrent orientation of fossils correlates with the paleoclimatic of SW Passat wind-direction models based formerly on palaeodune analyses. For project financing, I thank the sponsor Aktion Mensch, the Geopark Terra.Vita; for project coordination, the Kultur- und Verkehrsverein Hasbergen e.V., especially H.-U. Bardelmeier and W. Wessel; and finally the Bildungswerkstadt Hüggel (T. Sautmann). Permission for the excavation was given by ground owner F. Plogmann. The product development manager H. Schallenberg from the company Quickmix helped to create new useful products at the site and in the laboratory. The company thankfully sponsored the material. U. Scheer (Ruhrlandmuseum Essen) and Dr J. Fichter (Naturkundemuseum Kassel) provided useful information. The excavation itself was coordinated at the site by J. Haunert (excavation technician), who also made inventories and did preparation work. Finally, I thank all the team who worked and supported the difficult but ultimately successful work. Critical review of early drafts were thankfully done by Dr S. Brandt, Dr W. Munk and Dr T. Bürgin. Reviews and English improvement came mainly from Dr S. Turner.